Preheat oven to 350°. Bake pecans in a single layer in a shallow pan 10 to 12 minutes or until toasted and fragrant, stirring halfway through. Remove from oven, and cool completely (about 10 minutes). Reduce oven temperature to 250°. Cover 2 large baking sheets with parchment paper. Draw 2 (8-inch) circles on each piece of paper. Turn paper over; secure with masking tape. Process cornstarch, salt, toasted pecans, and 1/2 cup sugar in a food processor 40 to 45 seconds or until pecans are finely ground. Beat egg whites and cream of tartar at high speed with an electric mixer until foamy. Gradually add 1 cup sugar, 1 Tbsp. at a time, beating at medium-high speed until mixture is glossy, stiff peaks form, and sugar dissolves (2 to 4 minutes; do not overbeat). Add half of pecan mixture to egg white mixture, gently folding just until blended. Repeat procedure with remaining pecan mixture. Gently spoon egg white mixture onto circles drawn on parchment paper (about 1 1/2 cups mixture per circle), spreading to cover each circle completely. Bake at 250° for 1 hour, turning baking sheets after 30 minutes. Turn oven off; let meringues stand in closed oven with light on 2 to 2 1/2 hours or until surface is dry and meringues can be lifted from paper without sticking to fingers. Just before assembling cake, stir together mascarpone cheese and vanilla in a large bowl just until blended. Beat whipping cream at low speed until foamy; increase speed to medium-high, and gradually add remaining 1/2 cup sugar, beating until stiff peaks form. (Do not overbeat or cream will be grainy.) Gently fold whipped cream into mascarpone mixture. Carefully remove 1 meringue from parchment paper; place on a serving plate. Spread one-fourth mascarpone mixture (about 2 cups) over meringue; top with 1 1/2 cups sliced strawberries. 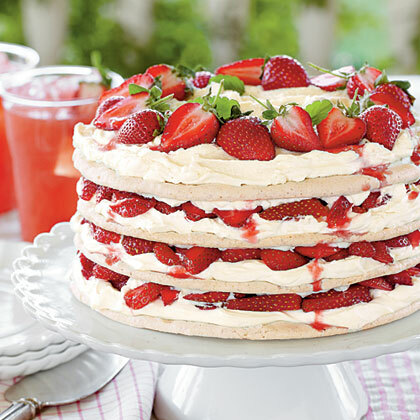 Repeat layers 2 times; top with remaining meringue, mascarpone mixture, and halved strawberries. Serve immediately, or chill up to 2 hours. Cut with a sharp, thin-bladed knife.